So, you have decided to enrol on a 300-hour yoga teacher training course! 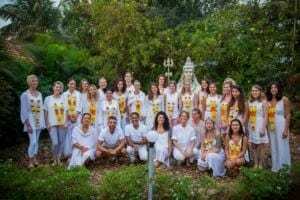 Here is my experience, tips and advice before you start the course, with specific information about starting a course with Sampoorna Yoga. 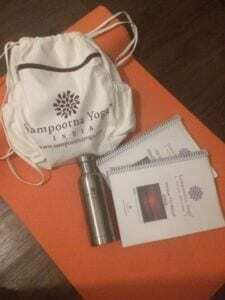 A lot of the information I explain here is given to you at the start of the course with Sampoorna yoga. The joining instructions are really detailed and provide you with most of the information you need. If you have any questions you can email Sampoorna and they always got back to me quickly. The website is also easy to follow and provides a good amount of detail. 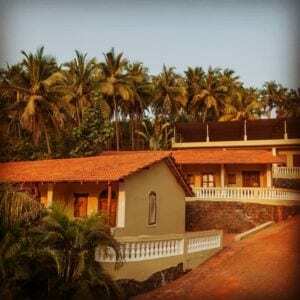 This is what gave me a lot of confidence to book with Sampoorna in the first place because they appeared to be professional in how they operated and they didn’t disappoint throughout the experience. Once you are enrolled on the course you receive joining instructions which provide the key information. I recommend reading these fully and you will probably find any questions you have are answered here. There is also a welcome meeting 4-5pm the day before the course where some things are explained. This is followed by a course dinner at 7pm. It is the first opportunity to meet your course mates and teachers and there will be some introductions. You will receive a pack including your course materials, a rucksack, water bottle and Sampoorna T-shirt after the welcome meeting. The details of the pre-coursework is included in the joining instructions. For us this consisted of some DVDs to watch. There were about 4 in total. I managed to find these on amazon/eBay and I recommend this as a way of saving a few pennies if you don’t mind them being second hand. You will be doing a lot of yoga practice on the course, including around 3-4 hours of physical practice a day. You will therefore need to make sure you are physically fit before starting. I would recommend trying to get into a habit of a daily practice in the few months upto the course, if you don’t practice regularly already. You will also need to get up early on the course with the first class starting at 6.30am so it is also good to get into the habit of getting up early as well so that this is not a big adjustment to make when you start. You will do meditation and pranayama as well as asana practice so you may find it useful to practice this if you are not already. Guidance will be provided on the course however if you have not been practicing this area as much since your 200-hour training. 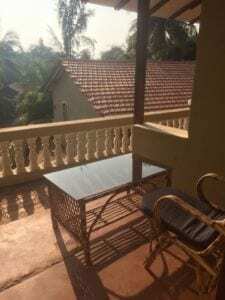 The accommodation types (Zen, Sampoorna, Anaya, Shivalaya and Varun) are detailed on the website and the images give a good representation of what you can expect. You have the option of either sharing or having your own room. I thought it was good that Sampoorna try to pair you up with someone who speaks the same language, where possible. Even though the course is in English I can understand for anyone who doesn’t speak English as their first language, it would nice to be able to relax and be able to speak in their mother tongue when they were in their room. Despite this, Sampoorna obviously doesn’t know you or who you would get on with, so you do have a risk of ending up with someone who you have differences with. There was an example of this with 2 people on my course who were sharing but Sampoorna managed to find a solution to relocate when requested. Sampoorna always work to make sure everyone is happy! I chose to have my own room. Although it was nice to spend time with everyone during the course, I enjoy my own space sometimes, so I personally preferred this option. Everyone is different though, so you might prefer sharing and having the company. It is also a good way to reduce the cost of your trip if you are happy to share as a shared room was about 400 Euros cheaper. You state your preferred accommodation when you book the course. Your preference could get booked up quickly, so an early booking would avoid disappointment, but I would have been happy with any option really as they are all a similar standard. I booked quite early (the May before my January course) so I was able to get my preferred choice. Check-in to your accommodation is 2pm onwards the day before the start of the course. Check-out is 10am the day after course ends. 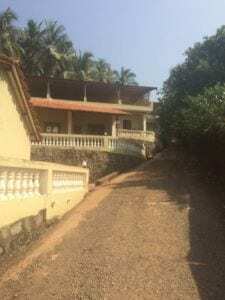 If you want to arrive in Agonda before or leave after the course, you probably need to find alternative accommodation. 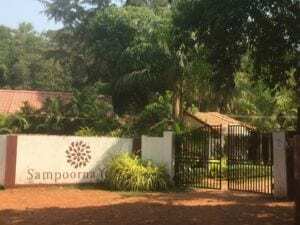 Sampoorna often run courses one after the other so there are unlikely to rooms available outside your course. There looked to be lots of options for places to stay in the area. The little beach cottages running along the beach looked like cute options and I understand they were reasonably priced, so I would recommend checking those out. 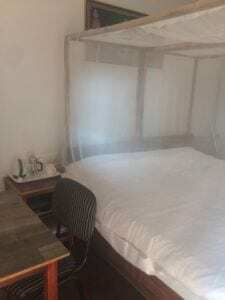 I stayed in Anaya for the duration of my stay and I was happy with the accommodation. Coming to India I was a bit worried about the cleanliness, but everything was kept clean. My room was cleaned, and the linen changed twice a week. Everything is within walking distance on the campus so whatever accommodation you choose, you will be able to get to your classes in a few minutes. 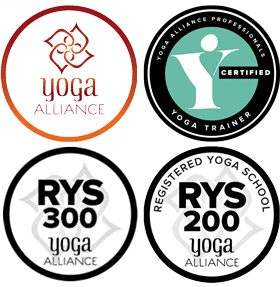 There are a number of yoga shalas throughout the Sampoorna yoga village and you will probably be in the same location for the duration of the course. The deposit for the course (including accommodation and food) is paid in advance. You then pay the balance for the course when you arrive. There are also some discounts available for early bird bookings (at least one month in advance) and they have just brought in a referral discount as well. Check out the website for the latest prices and discounts. 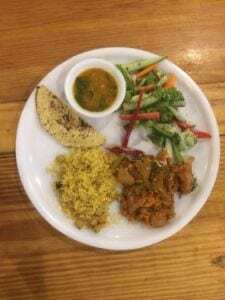 The food at Sampoorna is vegetarian and there are always vegan and gluten free options. 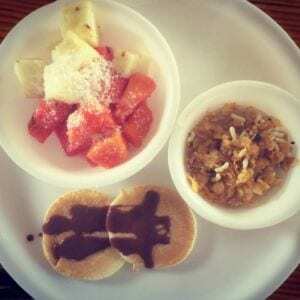 Sampoorna will also cater for other dietary requirements, such as allergies. I would advise you discuss with them before booking the course to check they can cater for your specific needs. My friend who came to stay with me at the end of the course has a severe nut allergy. Sampoorna were great in making sure she was safe and had good options at meal times. The main waiter at the restaurant would check with the kitchen and was knowledgeable on what she should avoid and could then advise. Filtered water is available all the time at the yoga village. You may prefer to drink bottled water, particularly in the first few days or if you get sick. You can purchase bottled water on site as well. There are no meals provided by Sampoorna on Saturday evenings and no meals on Sundays. 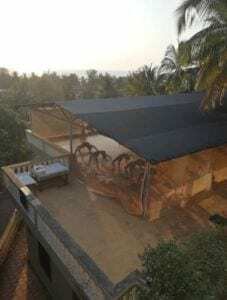 As good as the food is at Sampoorna it was nice to have the opportunity to try restaurants in Agonda too. My favourite and a favourite for many of the students, is Zest! So many delicious vegan food options! I definitely recommend! Sampoorna can arrange airport transfers. This cost 30 Euros each way (cash payable to the driver EUR/INR) and I am not sure whether you could find a cheaper option but this was a hassle-free way of organising getting to and from the airport. Sampoorna took the details of the flight so that the collection time could be changed if any delays with the flight. If you are arriving at the same time as someone else on the course it is possible to arrange to share (up to 3 people) so it is nice to travel with someone else if you can. Before starting the course Sampoorna set up a facebook group for your course group which you are invited to join. It is a good way of finding out if anyone is on the same flight before you arrive so that you can arrange sharing a taxi. Once you are on the course the teachers would sometimes post some course related items in the group such as the weekly timetable or links or pictures from items discussed in class. It is also good for sharing pictures with each other and keeping in touch after the course.